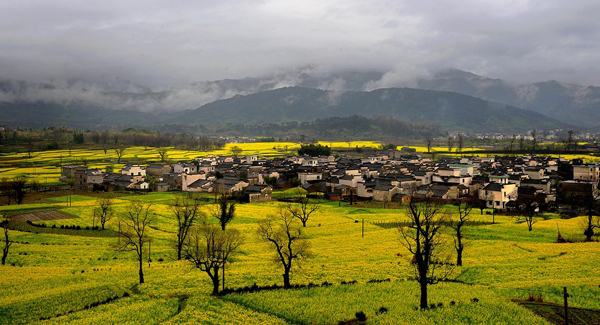 The scenic village of Lucun is just one kilometre (0.6 mi) north of Hongcun village, a UNESCO World Heritage Site, and matches it in both artistry and beauty. The village was originally established during the late Tang Dynasty (618-907), although much of its magnificent architecture dates back to the Ming (1368-1644) and Qing (1644-1912) dynasties. Of the more than 140 stunningly well-preserved buildings dotted throughout Lucun, Zhicheng Hall is considered the most spectacular. 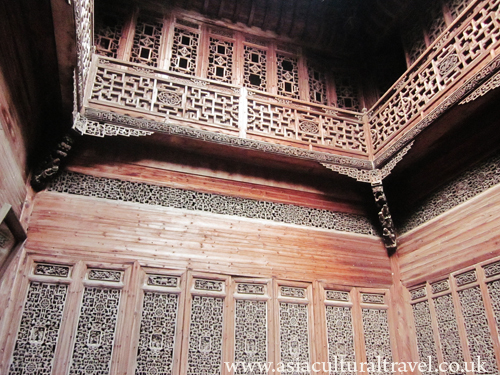 This hall is almost entirely made out of woodcut pieces, a characteristic feature of Huizhou-style buildings. These wood carvings are so elaborate and vivid that setting foot inside this hall is sure to take your breath away. Plus you’re spoilt for choice if you ever need to knock on wood! It was constructed by the wealthy merchant turned politician Lu Bangxie during the Qing Dynasty (1644-1912). By that time, Lu had amassed such a colossal fortune that he had earned the nickname Lu Baiwan, meaning “Lu the Millionaire”! The building complex consists of seven courtyards, of which Zhicheng Hall was used by Lu as his own personal living room. The interior is so exquisite and well-preserved that it is frequently used as a set for operas and television series. After all, when your name is “Lu the Millionaire”, the only thing you can’t afford is to look cheap!